Meredith Jones is an internationally-recognized researcher, writer, and speaker. She is an expert in the alternative investment industry with over 20 years of experience. 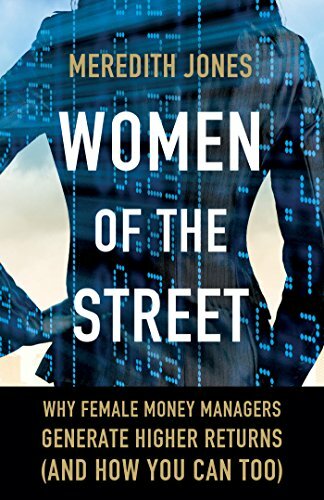 Meredith is an alternative investment consultant and author of Women of The Street: Why Female Money Managers Generate Higher Returns (And How You Can Too), which won an Axiom Award Gold Medal in 2016. She was named one of Inc. magazine’s “17 Inspiring Women To Watch in 2017” and was named a Distinguished Author by the Securities and Exchange Commission in 2018. She has been a regular columnist for Institutional Investor and is currently a contributor for Market Watch. A a sought-after speaker, Meredith has presented research in Tokyo, London, Paris, Hong Kong, Cape Town, Johannesburg, Sydney, Geneva and more. She wrote and delivered a TEDx talk at TEDxUIUC in 2018. Meredith also serves on the Board of Directors for Rock the Street, Wall Street a non-profit that provides financial and investment literacy courses for high school girls. She began her alternative investment career at Van Hedge Fund Advisors International (VAN), where she was Director of Research. At VAN, Meredith was responsible for manager selection, due diligence, index construction and aggregate industry research for the $500 million fund of funds. Meredith was then recruited by hedge fund analytics provider PerTrac Financial Solutions. There she focused on industry trends with an eye to providing actionable insights and information. Her research on emerging managers, initiated in 2006, and women and minority-owned funds created new investment categories. It has changed the way investors and money managers behave - both in the way investors allocate and how money managers market to and seek investors. Meredith then went on to be Director at Barclays Capital Strategic Consulting Group. There she consulted for clients and authored white papers, including her first white paper on women and minority-owned investing. She was recruited to Rothstein Kass, a professional services firm with a focus on alternative investments, from Barclays. Until the acquisition of Rothstein Kass by KPMG, Meredith served as Director of the Rothstein Kass Institute, an Alternative Investment Think Tank. At the institute she created the first Women in Alternative Investments Hedge Fund Index to measure performance of female hedge fund and private equity managers. Meredith is a foodie and wine lover and maintains a love of charcoal and open flames when it comes to her own cooking. She is a figure skater and skates regularly, relying on an inexplicable addiction to decaffeinated coffee to survive her early morning ice times. Interested in having Meredith speak to your company or group? Contact us below or take a look at her upcoming speaking calendar. Meredith is a leading expert on both diversity investing and emerging managers, and her research on those topics have spurred conversations and changed investing behavior in the industry. — Denise K. Shull, Author "Market Mind Games"